To be the leader in the distribution of electrical, plumbing, HVAC, and industrial products by exceeding customer expectations in service and value. As it was 100 years ago, Cayce Mill Supply’s commitment to service is our foremost priority. Clinton H. Cayce founded Cayce Mill Supply Company in 1919 selling everything from milling supplies, leather belts, pipe valves, and even explosives. 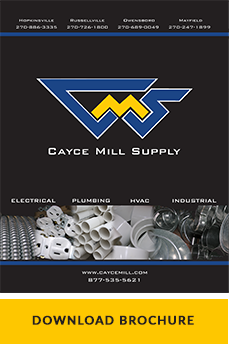 Now through five generations of the Cayce family, Cayce Mill Supply has refined its product offering to the channels of electrical, plumbing, HVAC, tools, and industrial supplies since the 1930’s. One of the most powerful attributes of Cayce Mill Supply is the diversity of our customers. From serving the largest of manufacturing facilities to the independent residential contractors in our local market and shipping to over 40 states in the continental U.S. for our facility maintenance customers, we serve them all. Our diverse customer base equates to a vast variety of stocked products to select from in order to meet your project needs. It is also this diversity which expands our product knowledge to help solve your challenges. At Cayce Mill Supply, we value your business. Our sales associates are ready to assist with all of your needs. Whether industrial, commercial, or residential and across all of our product channels, our sales force will strive to find the solution you need with exceptional value. Our inventory and our people are our strengths. Your time is valuable, and by stocking electrical, plumbing, HVAC, and industrial products we can help you reduce the number of vendors and purchase orders processed to keep your business moving. Let us further assist you by providing custom labels, stock bins and inventory replenishment with our customer storeroom management. Shop with us 24/7 at shop.caycemill.com or browse our product catalog listing over 9,800 stocked items. While Cayce Mill Supply maintains healthy local inventories at all locations, the back bone of our distribution network is our 170,000 square foot main location that also serves as our distribution center for all of our operations. With daily stock replenishment between all locations, we work hard to keep the material you need in the right place at the right time. Whether you are on a scheduled truck route, or need something a little quicker, with over 20 trucks moving within our territory, you are sure to get what you need in a timely manner. In addition to our distribution business, Cayce Mill Supply has a number of retail showrooms. Our Hopkinsville showroom holds the title of being the largest and most beautiful in Kentucky. Whether a homeowner building or remodeling a home or a design team working on a commercial project, our seasoned team of designers strive to make your choices personal and easy. From CAD drawings of cabinetry, lighting layouts, plumbing design, and even lending a fashionable eye, we make every project, large or small, a success. Shop with us 24/7 at thedesigncenter.caycemill.com.